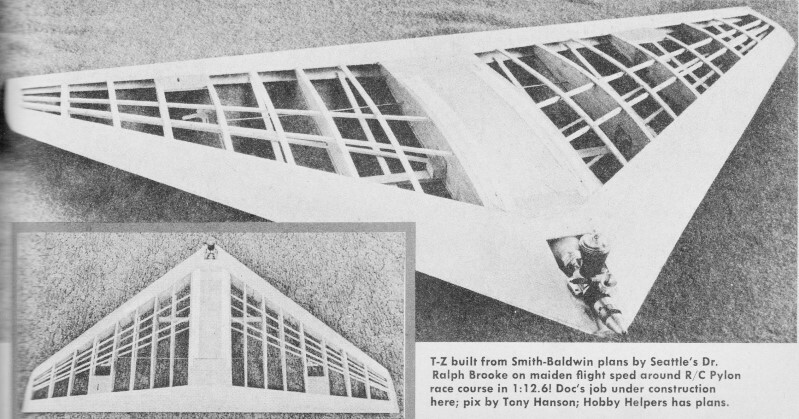 When I first saw the Talon Zephyr I thought it was a 1/2A model because of the familiar engine shape. It turns out to be a Tee Dee Cox .15. Although Cox ceased making the engines long ago, you can still occasionally find one listed on eBay. In fact, I just looked and there's one available for $105. That's a lot more than the typical 1970s era price of about $20, but compared to a new high quality engine today, the price is not out of line. The biggest issue is keeping a supply of the glow heads available. Some people have successfully drilled and tapped the center area to accept a standard threaded glow plug. But I digress. The Talon Zephyr might be a great model to scale down to .049 size and some modern miniature R/C equipment. A super-hot hopped-up Max 15 has been sent along to us by Walt Schroder, so maybe we'll have an even faster pylon delta racer next season. Remains of crash "heard 'round the modeling world" below. Everybody amazed by T-Z's speed. Dr. Brooke (below) and his T-Z; seen bottom of page without receiver. Doc reports he uses no switches, just plugs in power pack. 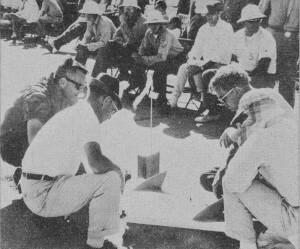 Witnesses to "Talon Zephyr" flights at the '62 Nats all agreed that it was the fastest ship entered in the Pylon event. The belief that the Delta configuration is best for speed was widely expressed. 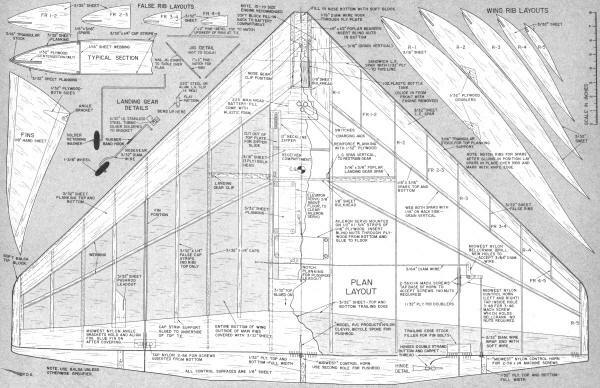 For the benefit of those who have expressed a desire to build a .15-size ship, the plans are presented herewith. Should you have no interest in pylon flying and want only a high performance aircraft, the Talon Zephyr will still meet your needs. The craft will climb out of sight vertically since thrust can exceed weight. Bob and I had built many Deltas before we began plans for our 1960 model. We had worked together in his basement for many an evening incorporating the best features our previous ships into the design. Bob began construction immediately, but prior to completion of mine, I had heard of the new Tee Dee .15 and decided that this one would be built around that engine. Some delay ensued while I laid out plans for the little ship, but construction proved simple, and my craft was ready to fly before the "Hustler" was completed. Having used Talon zippers, at Bob's suggestion, I called it the Talon Special." The Special was destined to a short life. On the first flight excessive up trim resulted in too much altitude too fast. A prolonged dive to bring it back resulted in too much speed and the point at which vibration found the right aileron reed was soon reached. Surprisingly, the ship was not damaged beyond repair, but since construction is simple, I decided to build anew. The phenomenal climb of Talon Special sparked a thought which was to be used in the new ship - VTO. Considerable weight can be saved by eliminating the landing gear. Talon Special tipped the scales at three pounds. I figured that without the gear, and with lighter equipment, the ship could be flown at 2 pounds even. 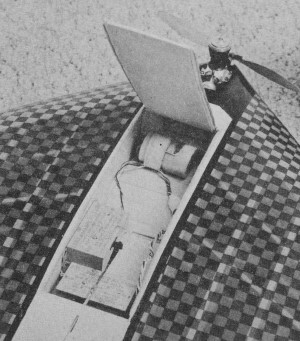 The Special flew with three servos, one being used for elevator trim, but it was decided to use only two in the Zephyr. 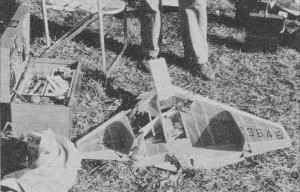 The receiver posed a problem until the Toledo R/C conference in February '62. While there, I saw the New Haven Superhet 10 channel. Immediately on returning home I wrote Jack Fisher and explained my problem, emphasizing the fact that I was concerned about vibration. He assured me that there would be no troubles, so the receiver was ordered. The ship although completed shortly thereafter still had not flown when we attended the Ft. Wayne meet in June. We explained to Jack that I was still waiting for a transmitter to fly the ship. He offered to match his reed bank to my transmitter, and weighted the reeds that night. Again the vibration bugaboo worried me, but since Jack was willing to risk the reputation of his reed bank by increasing the weight of the reeds, I was willing to risk a ship which could be replaced in two weeks. 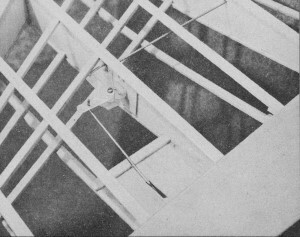 My fears proved to be unfounded, and the two ounce receiver contributed greatly to keeping the weight at two pounds ready to fly. 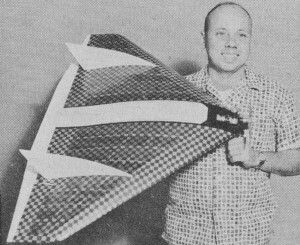 T-Z built from Smith-Baldwin plans by Seattle's Dr. Ralph Brooke on maiden flight sped around R/C Pylon race course in 1:12.6! Doc's job under construction here; pix by Tony Hanson; Hobby Helpers has plans. Hand launching for test flights proved no great problem. Static thrust of the Tee Dee exceeded weight of the little craft - shown by the fact that we could hold it down vertically with open palms over its leading edges while the little mill screamed. 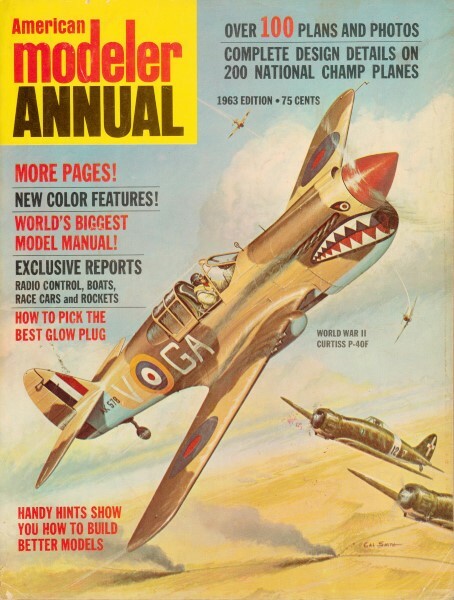 On the first flight, Bob just held it near the wing tips and gave it a flip when I nodded. A VTO was scheduled on the second flight. On release, it rolled to the left and streaked under the rope fence about one hundred feet away. It was half way through the parking lot before I regained my composure and began flying it. Since time was catching up with us a landing gear was added that night. Test flights continued and the ship was trimmed out, but no time was available for practice on the pylon course before the Nats. Tank problems aborted the first three attempts at the Nationals. These were corrected between the third and fourth rounds and the ship performed as intended on the fourth try. Because of an error, only four laps were completed on this round. On the next attempt, the near pylon somehow got in the way; the steel post sliced the ship in half, so no official times were posted. However, it appears that a time of one minute flat is possible if an experienced pilot is flying the course. Building poses no particular problems if done in a jig which supports the leading and trailing edges above the table. Though the ship gets its name from nylon zippers, it is recommended that metal zippers be used. The nylon tends to bind when side movement is restrained as in this application. 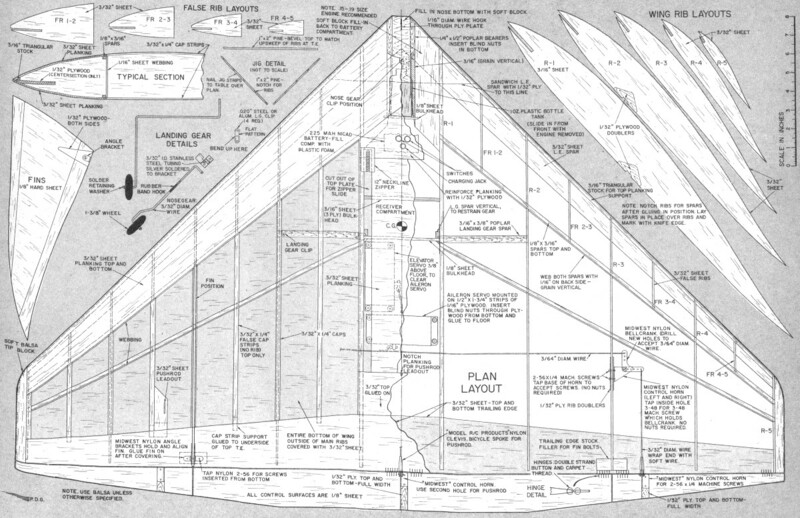 Details of construction on plan should require no explanation. Light weight balsa is essential to speed. For maximum performance, weight should not exceed 2 1/2-lbs. The original, after modification to include landing gear, weighed 39-oz. This gear, as explained, was an afterthought; it could be improved if built into the ship.